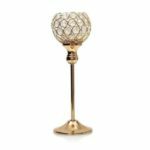 This crystal candle holder comes with a goblet tea light holder sits atop a beautiful pedestal to create a graceful wine glass stem shape. Hollow-carved design delivers a sense of dignity with natural freshness. 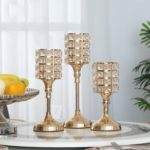 It will be an nice decoration for Christmas, holiday, wedding, parties, special events or candlelight dinner. 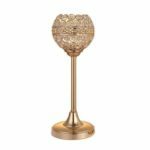 This crystal candle holder comes with a goblet tea light holder sits atop a beautiful pedestal to create a graceful wine glass stem shape. It is easy to add a splash of glam with the shining of the crystal jewels that surround the bowl. Hollow-carved design delivers a sense of dignity with natural freshness. With its unique fashion and elegant expression of the special passion and artistic taste. The base and stick are made of high quality materials with electroplating craft, solid and durable. 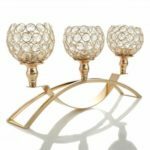 Fits for flameless electronic candle or tea light candle, it will be an nice decoration for Christmas, holiday, wedding, parties, special events or candlelight dinner, give you a romantic and relaxing atmosphere.